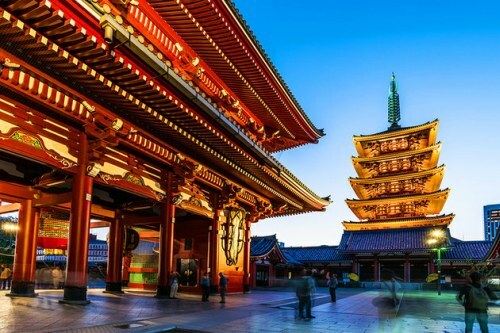 United Airlines and ANA have dropped the price of their flights from Toronto to Tokyo, Japan down to between $585 and $650 CAD roundtrip including taxes. The flights where you fly with ANA (very good airline) both ways in the price range of $500s/$600s CAD roundtrip including taxes are the most desirable flights of this deal. They're only available on certain dates though. There's quite a few more date options if you only fly with ANA in one direction, and United in the other, or United both ways. On the FlightHub search results, you may need to scroll down quite a ways to find the flights with ANA in both directions. Their airline filter doesn't work 100% properly. If you filter it down to only show ANA flights, it still shows the United flights in one of the directions. As you've probably noticed, when you get to Momondo or Skyscanner, sometimes the booking site showing the cheapest price for this deal is ExploreTrip. They're definitely one of the lower quality booking sites out there, and not normally one I would recommend, if a higher ranked booking site were showing this price. However, I can tell you that with a very similar deal that came out from Vancouver last month, ExploreTrip issued these tickets just fine. With previous deals that I've seen from ANA or United over the years, as long as the third party booking site is able to get the 13 digit ticket # issued, that's all that really matters, as this means your ticket has been issued by the airline. You can use this ticket # to check your reservation directly on the airline's website. Your reservation is just as solid as though you booked with the airline itself. Update 12/29 - Delta has now dropped the price of their flights from Toronto to Tokyo, Japan (HND) down to $604 CAD roundtrip including taxes. Flights from January to June 2017 are available. June 6 to June 20 is an example of the furthest away dates for this price. Delta offers a complete refund for cancellations (up until midnight the day after the booking is made), giving you a bit of time to decide. toronto, yyz, flight deals, delta, asia, tokyo, japan, nrt, east asia, hnd, united airlines, ana and all nippon airways. 7 Responses to "Toronto to Tokyo, Japan - $585 to $650 CAD roundtrip including taxes"
Booked via momondo and confirmed booking through tripsta but unfortunately, my tickets got cancelled due to a "technical issue". Hmmm, sorry to hear that Salt. Sometimes a booking site can't get the tickets issued fast enough before the price becomes unavailable, particularly during a crazy, high-demand booking frenzy. cant find the prices as low as 585$ to 650$ and i have been looking at tokyo flights for the past month. Unfortunately these were gone by yesterday afternoon. They went quick! I can't find this price $585 to $650 CAD roundtrip including taxes" from Toronto to Tokyo in April. I have been trying to look for Toronto to Tokyo tickets past few days and can't find any ticket within above price range. Unfortunately these sold out really quickly. They were posted in the morning, and had sold out by late afternoon of the same day. Are you already signed up for the e-mail alerts? That's the quickest way to be notified when something is posted.